On the drive up, on Cultas Lake were three DC Cormorants. Migrating birds for sure. It was very nice at Columbia Valley. A few WC Sparrows were singing on territory. Pretty soon Savannah Sparrows will be as well. In the small little pond were Ring-necked Ducks, Mallards and two new species for the Columbia Valley list, Bufflehead and American Wigeon. Further up I thought I heard a Hutton's Vireo but couldn't confirm it. The intersection of Columbia Valley Rd and Henderson I did get a pair of Hutton's. They were agitated so definitely a breeding pair. There was a pair last year in the same location as well. I did get a picture of it. On Iverson Rd was a decent sized flock of Evening Grosbeaks. Here is my list, no Sapsuckers today. 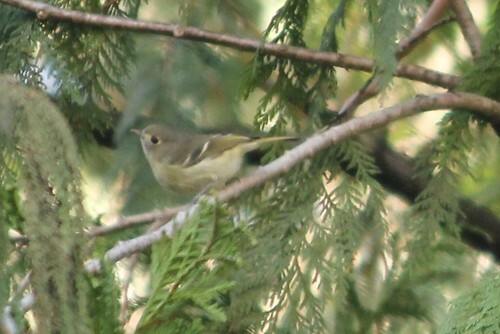 Chris, good find on the Hutton's Vireo again. Columbia Valley is looking to be a very reliable place to find this species around here. We're also up to 93 species recorded in Columbia Valley. Way to go on the vireos Chris. Those are hard birds to find normally. Interestingly I have recently returned from S. California where the HUVI sang continuously. After a couple of hours that 2 syllable song can get a little tedious!